I have begun to use "shio koji", the salt malted rice for seasoning since this spring. At first, I bought ready-made "shio koji", but now I buy only "koji" and make "shio koji" at home. It is very simple to make. You only need to mix 200 grams of "koji" with 95 grams salt and 400cc water. You put the mixed in a container and keep it at a fixed temperature. And in about ten days, a very delicious "shio koji" is ready. I use it for miso soup and all seasonings. 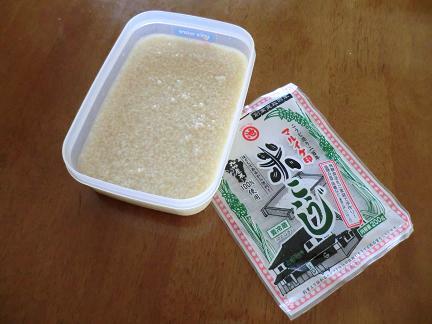 When I eat food seasoned with "shio koji", I feel refreshed and cheer up. I love ferment foods!